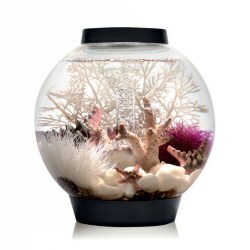 Explore how animals live in their different homes with Kaplan's selection of terrariums, aquariums, and habitat centers. 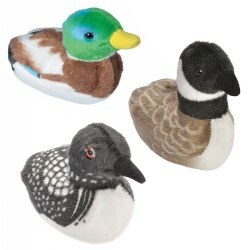 Products also include stuffed animals and animal figurines. 2 years & up. 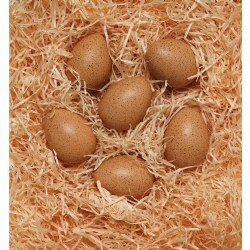 This realistic set of speckled eggs contains three pairs with matching sounds. Highly tactile and enormously appealing, the eggs are a simple and enjoyable way to help children develop early auditory discrimination skills. Children will delight in finding out which eggs go together and have the same sound--and then mixing them up again to have another turn! Contains 6 eggs measuring 2.5"x 1.875" inches each. 3 years & up. 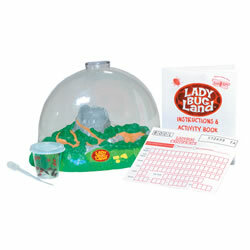 Adorable jars have ladybug wings that open to invite little learners to investigate insects. Wings open to reveal a 3.5x magnifying lens. 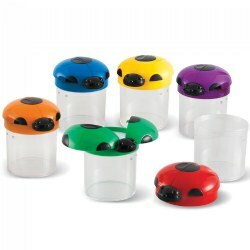 Screw-on cap and air vents keep specimens secure. 4 1/2"H x 3 1/2" in diameter. Set of 6. 4 years & up. Keep your creature for a short time, then let it go. 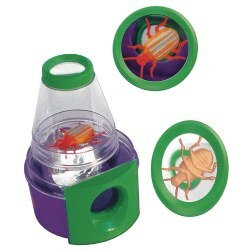 This bug viewer allows children to see the bug two ways, from the top or from the side. 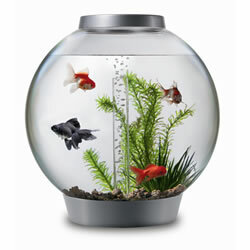 It is watertight, so children can view tadpoles or small fish. The peeper is escape proof and won't break or tip over. Great for show and tell. Comes with a beetle replica. 3 years & up. Imaginations start here as chidren discover animals from across our lands, creating and building habitats for them to live in. Great for block play, science and sand and water. 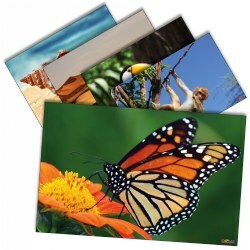 Animals range from 1 1/2" to 3". Set of 60. 3 years & up. Childen will love the small size and variety of animals. Perfect to use with unit blocks or small enough for table blocks. Animals range from 1 1/2" to 3". 6 years & up. Watch ants as they build 3-D tunnels in translucent gel. Food and moisture are self-contained for a maintenance-free experience. 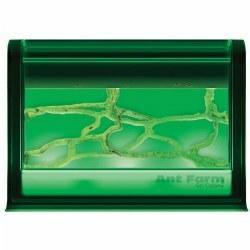 Farm includes Ant habitat, LED light-up module, tunnel starter tool, and instructions. Requires 2 AAA batteries (not included). Note: Ants are not included. Search online for ant suppliers shipping to your area, or make catching your own ants part of your ant adventure (see instructions). Adult Supervision Required. 3 years & up. Discover animals that swim the oceans. Includes: Penguin, Tiger Shark, Sea Lion, Starfish, Humpback Whale, Dolphin, Eagle Ray, Hammerhead Shark, Sperm Whale, Turtle, Octopus, and a Moray Eel. This set comes in a reusable acetate tube that snaps open and closes for easy storage. 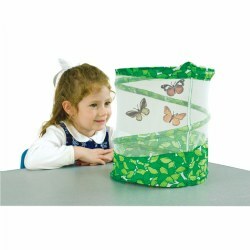 Perfect for educational projects, traveling, collecting, and imaginative play. Includes twelve ocean animals caught in active poses measuring from 1 1/4" to 3 3/4". Non-toxic and BPA free. Experience the underwater life while encouraging responsibility. 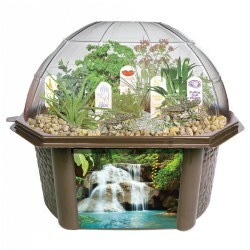 This heavy duty, leak proof aquarium is ideal for classroom viewing. 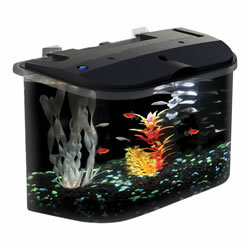 Includes 5 gallon acrylic tank, a light, and an internal filter. Made in the USA. 3 years & up. Discover animals that roam North American forests and mountains. 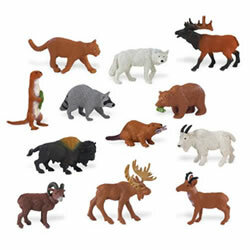 Includes: Mountain Lion, Raccoon, Wolf, Grizzly Bear, Pronghorn Buck, Elk, River Otter, Bison, Moose, Beaver, Big Horn Ram, and a Mountain Goat. This set comes in a reusable acetate tube that snaps open and closes for easy storage. Perfect for educational projects, traveling, collecting, and imaginative play. 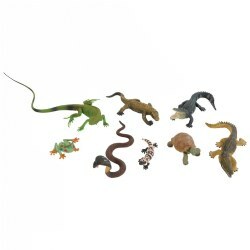 Includes twelve wildlife animals caught in active poses measuring from 1 1/4" to 3 3/4". Non-toxic and BPA free. 3 years & up. Discover animals that roam the desert. Includes: Horned Lizard, Scorpion, Prairie Dog, Rattlesnake, Saguaro Cactus, Big Horn Ram, Bobcat, Road Runner, Coyote, Armadillo, and Mountain Lion.This set comes in a reusable acetate tube that snaps open and closes for easy storage. 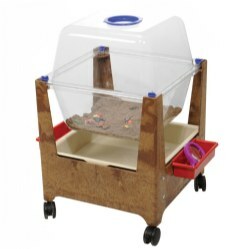 Perfect for educational projects, traveling, collecting, and imaginative play. 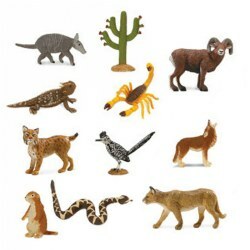 Includes eleven desert animals caught in active poses measuring from 1 1/4" to 3 3/4". Non-toxic and BPA free. 3 years & up. Discover animals that can be found in and near Rivers. Includes: Bald Eagle, Beaver, Snapping Turtle, Salamander, Alligator, Mallard Duck, Cottonmouth Snake, Bullfrog, Snake, and River Otter. This set comes in a reusable acetate tube that snaps open and closes for easy storage. Perfect for educational projects, traveling, collecting, and imaginative play. Includes ten river animals caught in active poses measuring from 1 1/4" to 3 3/4". Non-toxic and BPA free. 3 years & up. The ocean is a world filled with an array of sea creatures to explore! 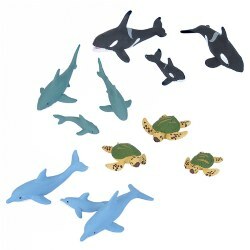 The Nature Tube Aquatic Family by Wild Republic features mom, dad, and baby animal figurines including the shark, dolphin, orca, and sea turtle. Learn more about aquatic life with fun facts inside. Package is reusable. 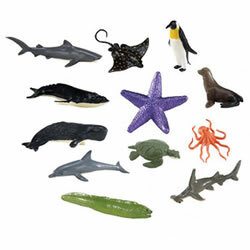 Included: 12 Aquatic Figurines and Fun Aquatic Facts. 5 years & up. 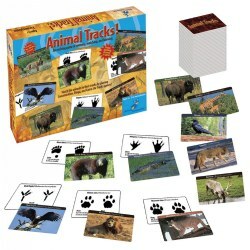 Students simply match the animals to their tracks through three different games. Includes 80 high quality and colorful cards, a plastic storage tray, and detailed instructions for using the cards for versions of Concentration, Bingo, and Guess-the-Tracks! 3 years & up. Discover eight tropical animals representing tropical habitats around the world. 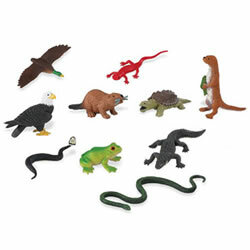 Includes: Giant Tortoise, Komodo Dragon, Baby Iguana, Alligator, Cobra, Gila Monster, Crocodile, and Red Eye Tree Frog. 3 years & up. Learn about common ducks that are seen in lakes and backyard ponds! Listen to the unique sound of the Mallard Duck, Loon, and Canadian Goose by pressing their tummy. Each 5" bird includes an educational hang tag which provides information about its appearance, habitat, and diet. Surface wash.
3 years & up. 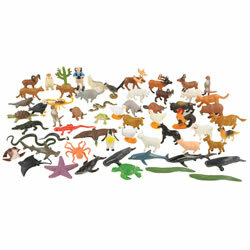 Gather up your animal friends for playtime fun! 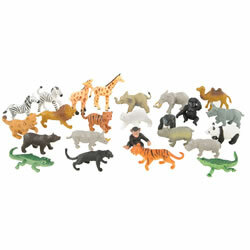 This set of Wild Republic Nature Tubes feature realistic animal figures from the farm, Africa, and household pets. Learn about your favorite animals with fun facts inside each tube. 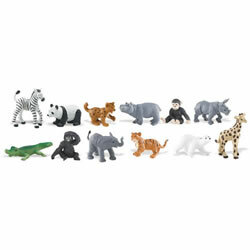 Animal figures measure between 1 - 2". 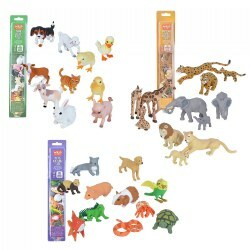 Included: 10 Baby Farm Animal Figurines, 10 Figurines of mom, dad, and baby African Animal Figurines, and 12 Household Pet Figurines. Purchase as a set or individually.